A chat plugin makes your site look more official. Live chat gives you an edge on your competitor. Live chat saves user’s time, it is convenient for the customers and provides an immediate access to help. By chatting with your website visitors you can guide each person into the check out moment and recover what might have been a lost sale. When compared to other support channels, live chat proves itself as more effective, fast which therefore reduces your support pressure and associated costs. This plugin overcomes that limitation by providing a real time customer support for customers. Once installed, the plugin adds a popup chat window to your web pages that users of Facebook will be familiar with. If you are no available for chatting, you can set the plugin to work as a contact form. . This makes sure customers and leads can always get in touch. Chat logs are stored for future reference and analysis and the chat window uses a tabbed interface to operators can easily manage multiple conversations without being deluged with separate chat windows. My favourite plugin right now. Chat with your customers on your site for sales and support easily, and beautifully. This is high quality live chat support service that I’ve used before. And it’s running on my online shop too. That means you don’t have to install multiple plugins to get all of these features. Specifically, it combines live chat, help desk, voice chat, and a social toolbar. This plugin is fully customizable, supports multiple languages and comes with many more features. Beyond these primary features, ClickDesk also allows web visitors to click to call and voice chat with you directly from browser or by dialing our local access numbers available in 40+ countries. You can always stay available through Gtalk for free (another option is Skype but you need premium account for it) The help desk component lets you or your employees manage emails and offline chat messages, too, with a built-in ticketing system. With Zopim Live Chat, visitors to your website will be able to chat directly with you through the widget and you can manage multiple conversations through the online Dashboard. This is another really popular live chat option for WordPress users. You can use the chat system on your mobile device thanks to dedicated mobile apps and you can use the included analytics to assess how visitors use your website. 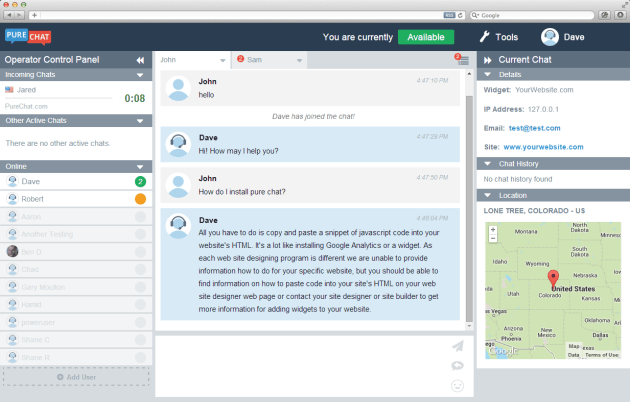 Pure Chat is a web app that makes it easy for website owners to chat with their visitors from anywhere! When users create an account and activate our simple, lightweight Pure Chat plugin for WordPress, they’ll be able to design fully-customized chat widgets that automatically appear on their site. Plus, Pure Chat has native mobile apps so business owners and support teams can offer top-of-the-line customer service from anywhere. In addition to the Pure Chat apps, the company also offers an easy-to-use web-based version that’s accessible from a desktop. Casengo Live Chat Support allows you to add live chat to your website quickly and easily. With Casengo Live Chat Support, you can handle questions via live chat, email, Twitter, or Facebook directly from your website. Casengo Live Chat Support helps you to respond faster to questions than ever, and to improve their satisfaction with a delicious combination of live chat and email. Do you want to chat or support your customers on the go? Casengo Mobile App available on iOs and Android. Push notifications were just added to the Casengo app, too, so you’ll know when customers are trying to get in touch while you’re. Live Chat is very fruitful for any website. Enabling live chat into your WordPress site is very easy & cheerful. They all bring something a little different to the table but what they share is an intention to make interacting with and converting customers just a little bit easier. All these plugins have something little different to share with you. What’s your favorite chat plugin? Did I miss any? I’d love to hear what you think! If you enjoyed this post, make sure to subscribe to NARGA’s RSS feed. Nice list, but I would like to add another name in that list that is eAssistance Pro Live chat. It is an excellent, secure and reliable third party live chat plugin. I uploaded Chat console and I am the admin – but for some reason it always says I am not available to chat… thoughts? Thanks for sharing great list! This will definitely helpful for businesses who are looking to develop next level customer support. These are good, however you could try Tagove which is newly built with multi-channels platforms.